Wild: Appear only on 2nd, 3rd or 4th reels. it can combine with other symbols to win double bonus. Scatter : Appear on 1st, 2nd,and 3rd reel or 3rd, 4th and 5th reels with 3 or more will trigger free game. All icons win combinations from left to right or right and left to complete. - The left-to-right winning combination must start from the leftmost reel and the symbol must be consecutively. - The right-to-left winning combination must start from the rightmost reel and thesymbol must be consecutively. - If there are multiple active betting lines with a successful combination, bonus will be added up. - Spartan Wild Image can replace other symbol and complete the winning combination with other icons. 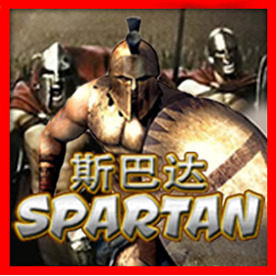 - Scatter Win in Spartan are multiplied by total bet . - This game is a card guessing game, players need to guess the next cast of card "Big" or "Small." Whenever a successful guess is made, the magnification increases from x2, x4, x6, x8 to x10.